When I first moved into my condo, one of the first things I decided I needed to buy was a rug for my living room. I didn't have one in my old apartment, and even if I had it wouldn't have fit in my new 12'x16' space. I'd read in a few different decor magazines that if you're starting a room from scratch it's always better to purchase a rug first, as apparently it's easier to match upholstery to a rug than the other way around (If you read my earlier post, I had some difficulty finding a fabric for my sofa to match my new rug so I can't begin to imagine trying to match a rug to an upholstered piece). I was somewhat focused in my living room rug search in that I only went to one store. That's right, just one. I did however visit every single location of that store in the Greater Toronto Area (I'm not kidding, we looked at every one from Mississauga, to Scarborough and even north to Vaughan). The store in question was HomeSense. HomeSense is great for all sorts of things, but unfortunately for me being carless makes it a little difficult to visit. There are a couple of locations in the city, but they just aren't as massive and magical as the ones you can find in suburbia. Handily my mom came to town for a week or so to help me move, so I made use of her car. Aren't moms wonderful?? When you go into HomeSense the rugs are hung very neatly from the walls which is great - you can flip through them quickly and see the whole rug easily - not like some carpet stores where they're piled up on the floor and in order to see one you fold back the corner of the one above it, and invariably the only rug you're even slightly interested in seeing is the one on the bottom, so you have to somehow lift up the 25 or so rugs above it. . . . Ugh! I get winded just thinking about it . .
Anyways, back to the way HomeSense does it. 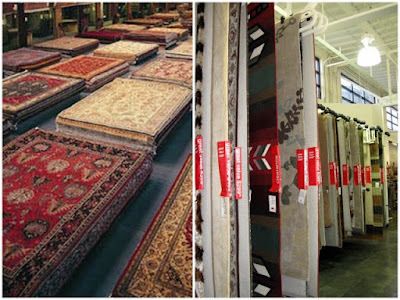 It's so much smarter, making it easy to flip through their rugs in just a couple of minutes. 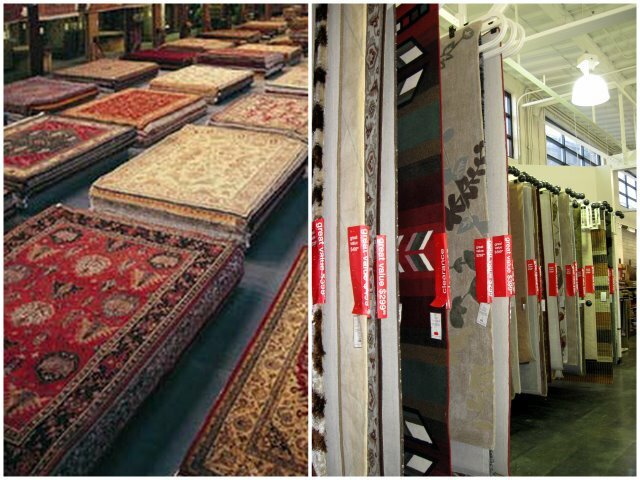 In theory, if you're just looking for a rug as I was you could walk in, make a bee-line to the rug section, and if you don't find anything be back out at the car in under 10 minutes. I've never managed to do that. Sigh - did I mention I think HomeSense is magical?? I'm like a kid at Disneyland - I walk through the doors and stop and stare, and can't decide what to look at first - I'm sure I look like the spectators at Wimbledon with my head bobbing back and forth. get it home yourself. Rugs are pretty heavy, and they're rather unwieldy. I think regular rug stores roll them up for delivery, but a rolled up 8'x11' rug won't fit in any car so the people at HomeSense fold it several times like a piece of paper, and place it on top of a cart so you can roll it out to your vehicle. 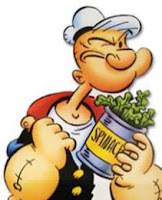 That part's not so bad, it's the part when you get to your destination that causes regular folk to wish they had a friend or relative who looks like Popeye. Given that delivering rugs is oh-so fun, my mom and I did it twice as the first one I bought looked decidedly washed out against my hardwood floor. 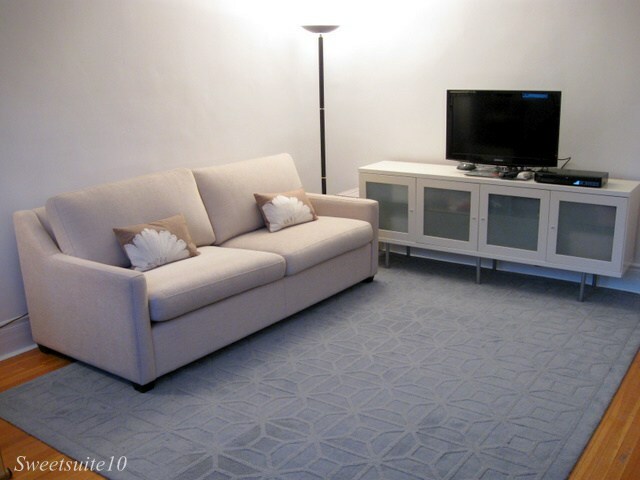 The second rug purchase worked much better, and thankfully it stayed on my floor once we'd heaved it into my home - have I mentioned that my condo in on the second floor in a building with no elevator?